Blending computer-based and teacher-led instruction promises to help schools meet students' individual needs by organizing and prioritizing staff and technology in more productive ways. However, this fiscal analysis of eight new charter schools that implemented personalized learning this year finds that early difficulty in forecasting enrollment and revenue can undermine implementation of the model. Student-to-computer ratios were higher and schools spent less than planned on instructional and performance reporting software. Projected budget deficits in five of the schools threaten their ability to sustain on public funding. Invest in student recruitment efforts up front to ensure enrollment targets are met. Develop a 'worst-case scenario' budget where fundraising and enrollment estimates fall 20 -- 25 percent below target. Manage contracts proactively: be explicit about needs, establish performance requirements, and negotiate trial periods to make sure products meet the school's needs. 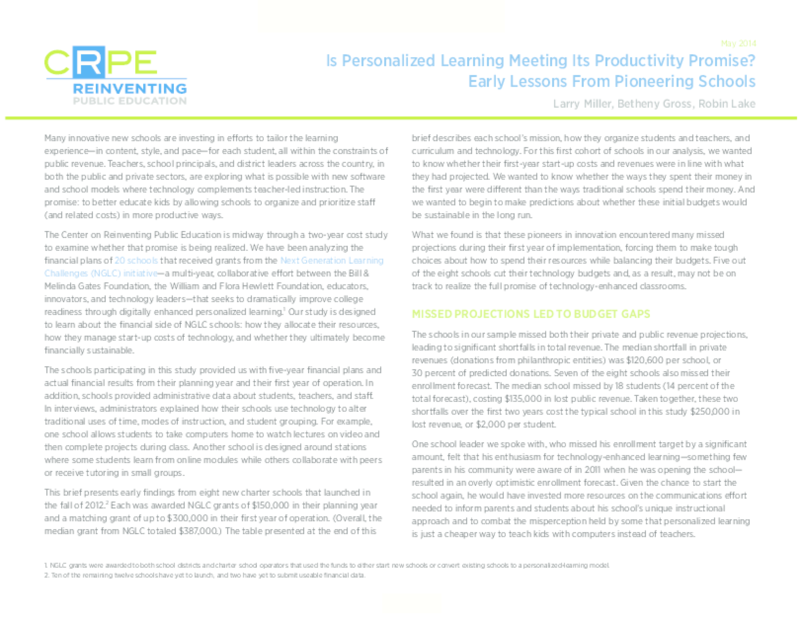 The eight personalized-learning schools included in this analysis were chosen to receive Next Generation Learning Challenges (NGLC) competitive start-up grants. CRPE is midway through a study of twenty personalized-learning schools that received NGLC grants. The study examines how the schools allocate their resources, how they manage the new costs of technology, and whether they can become financially sustainable on public revenues. CRPE will continue to track spending in all twenty schools this year and publish its findings next spring. This study is funded by the Bill & Melinda Gates Foundation. Copyright 2014 Center on Reinventing Public Education.